It is an entirely free AutoCAD with lots of great features that are absent in the AutoCAD. 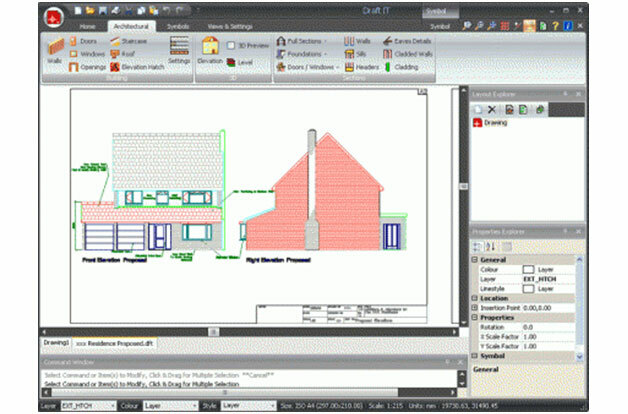 This professional grade tool has user-friendly interface and has DWG compatibility. It is free to use and share without any compromise. The NanoCad Plus has more productive features with an affordable annual subscription and updates. The NanoCad is available for Windows XP, Vista, 7, 8 and 10. It is a multipurpose software to design high-quality design and documents for all industries. The advanced and customized features can increase your productivity. The nanoCAD has a user-friendly interface with drawing space, menu items, and command line. It will be the right software for the beginner to start. This wonderful tool uses DWG industry standards to create and edit drawings without losing data. The nanoCAD has a powerful table editor with extensive features to create tables with embedded macros and formulas. The scripting engine of nanoCAD enables an average user to mechanize routine tasks. You can get scripting languages and visual script support. The DraftSight software enables you to access current DWG gives and create a new file at low rates as compared to other CAD products. This software has a user-friendly interface that is easy to use and facilitate easy changeover from your current CAD app. The 3DS enables you to access existing DWG files and create new files. This application is equally good for students, small and medium-sized organizations to large organizations and individual users. You can get the advantage of traditional menus and toolbars. The drafting tools enable you to snap, fillet, track guides and use various filters available for this application. You can use a wheel-mouse to the pan and zoom an image. You can freeze, lock or turn off layers as per your needs. You can get the advantage of different file formats, including jpeg, pdf, png, SVG, STL, etc. Smart calculator and home palette are its unique features. It is a 3D modeler used to design real-life items of different sizes. The Parametric designing makes it easy to modify your designs by checking your model history and change the limitations. This application is perfect to run on various platforms, such as Mac, Windows, and Linux. This app is good for home users, experienced CAD users, educators, and programmers. It is an excellent alternative of AutoCAD. You can import and export different formats to draw different objects. The FreeCAD is based on geometry kernel to make complex shapes and get the support of surfaces, curves, and brep concepts. The parametric features allow you to change the properties and other details as per your needs. The app has a sketcher to sketch 2D geometry shapes and build several types of geometry shapes. With robot simulation, you can study robot movements and get the advantage of an extended graphical interface. With the help of drawing sheets, you can draw 2D and 3D objects in SVG or PDF sheets. BricsCAD offers time-saving tools and .dwg CAD features to get more in less time. The software is designed with numerous tools that can help you in 3D modeling and 2D drafting. The user-friendly interface makes it easy to get the advantage of its powerful features for a consistent experience. A context-sensitive cursor can speed up your workflow, and you can get the advantage of cloud connectivity for the collaboration of all projects. The BricsCAD offers solutions for 3D data exchange, metal designs, and modeling. BricsCAD offers a friendly interface that enables you to get the advantage of its all features. You can create 2D technical drawings, layouts and floor plans quickly with the innovative drafting tools. and rotate different angles and edges. With the help of intelligent Quad cursor, you can increase the speed of your work while keeping your screen clean. You can collaborate on all projects with the help of cloud connectivity. It is an open source application for Apple, Linux and Windows based on Qt and UI framework. It helps you to read DWG files and write DXF files. You can export JPG, PDF, SVG and PNG or other formats. The circle tools, polylines, blocks, layers and ellipse tools. It has good features that can help you to increase your productivity. You can design and export files as per your needs. You can get the advantage of more than 20 languages available for almost all major operating systems, such as Linux, Windows, Mac OS. You can get the advantage of DWG readings and SVG export. Arabic GUI language support is a plus of this application. It is free therefore, there is no need to worry about license cost and annual charges. The application is available in numerous languages for your help. You can use your talent and creativity because this software is tested to design drawings and 3D objects. Anyone can take the advantage of its great features because it is designed for new talent. The cadlogic is the best 2D software package available to create 2D images without any restriction. This software is particularly designed for architectural designs, building structures and other purposes. It is a powerful 2D software and free to download. It is suitable for all home and office users. You can create your own professional drawings with the help of this free 2D software. There are more than 5000 happy users of Cadlogic and you can be one of them. You can work with the unlimited free version of CADlogic to design numerous objects. With the help of cadlogic, you can create, save and take prints of your professional drawings. It is easy to use, and you can get the advantage of visual aids and commands. The powerful drawing tools will help you to draw lines, circles and arcs. Dynamic editing options will help you to get the advantage of different units and sheets. Every professional and domestic user can get the advantage of this free software. The DoubleCAD is a great program to design 2D and 3D images. It is a full-featured application to handle all designing and detailing needs. The user-friendly interface will help you to edit photos and graphic utilities. This free tool offers various features to sketch 3D to 2D images with automatic scaling and editing. You can import images for presentation and digital publishing as well. It is designed for both Windows XP and Vista. Every new and professional user can take the advantage of this tool. You can get the advantage of built-in functions and shapes, such as a circle, rectangle, etc. You can convert files and import and export to SKP, DWG, PLT, DXF, WMF, etc.